The story of the Colorado Buffaloes told by a UW fan. The Colorado Rockies are off to one of the best starts in franchise history with a 41-25 record (second best in MLB). In fact, the success of the new look Blake Street Bombers is the best in Denver sports history. According to Rockies scorekeeper and CU's Dave Plati, " (The Rockies) are 24-10 on the road and the first team in Denver major league history that is 14 games over .500 at any point in a season (Avs were +13 three times, Nuggets +9 in the ABA in '74-75). Best runs are a 24-8 span the Broncos were on the road from 2012-to early 2016, and the old Denver Bears were 17 over in both 1976 and 1980." Wow. 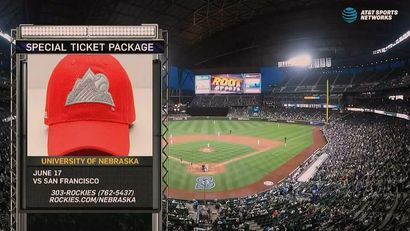 All of the hits keep on coming in LoDo, except for this June 17 promotion vs. the San Francisco Giants for Nebraska fans. One of the worst promotions in sports history features a red hat with a Rockies logo, that would only be cool with a "62-36, never forget patch". 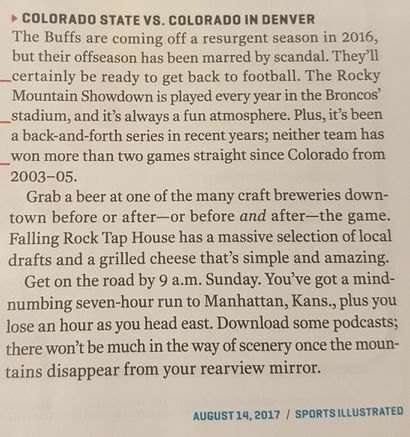 No Colorado love for the team we supported through the "tough years". Maybe next time Ralphie could run the bases? Colorado won a recruiting battle on signing day, flipping tight end Jared Poplawski from Arizona State. Poplawski was one of four high school teammates committed to the Sun Devils but a late visit to Colorado was enough for the Buffs to win out. The former Colorado star was waived by the Chicago Bulls last week but aims to bounce back with a trip to the NBA D-League. Does ESPN know Michigan's secret weapon? There's one player on the Michigan Wolverines football roster that you might not have heard of and ESPN has him listed as '-Q'. 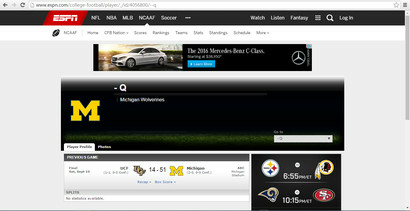 Far more than a typo, "Q" has a profile on Michigan's site and rivals something from a James Bond movie. In the movies, the letter was short for "Quartermaster." Maybe ESPN is trying to leak a secret identity of Harbaugh or can't keep up with how many players are on the Wolverine's roster. The world may never know. "Welcome to the fight!" That was the words from head coach Mike MacIntyre that fired up the Colorado Buffaloes before rolling to a 44-7 win against the Colorado State Rams. 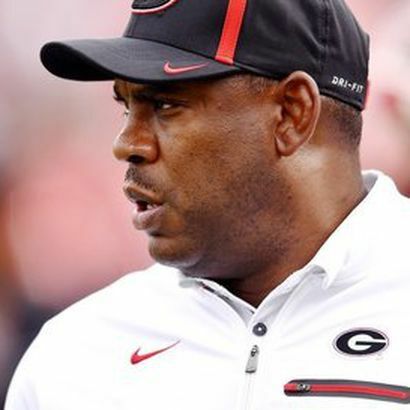 The emotional speech was heartfelt from Mac to his players and like something out of the "Friday Night Lights" playbook. CU starts the season off 1-0 and moves on to play the Idaho State Bengals at Folsom Field next Saturday (9/10) at 3:30 p.m. MT. Fox Sports writer Hunter Kinniburgh agrees "The Rise" is happening in Boulder, after naming the Buffs as one of the top underrated teams going into the 2016 season. He cited returning players like Sefo Liufau and Chidobe Awuzie, as leaders of CU's potential bowl berth hopes in 2016. Colorado's first order of business is the Rocky Mountain Showdown on Friday, Sept. 2 vs. CSU. Buffs fans are expected to wear blackout attire for the game. Kickoff is scheduled for 6:05 p.m. MT with the national telecast on ESPN.